Hey guys! Okay, so, today I have a LOT to talk about. 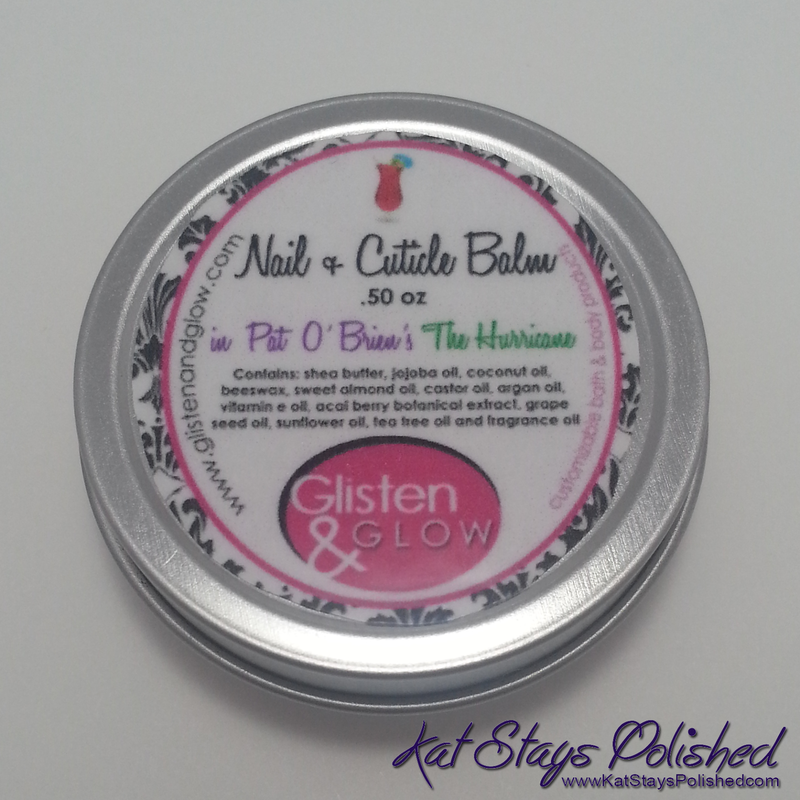 The post is going to be all about the *exclusive* Glisten & Glow Nail & Cuticle Balm in Pat O'Brien's The Hurricane. Before I get into that, I do want to say that I am fairly new to the Glisten & Glow brand but I am quickly falling in love with Jill's [the genius behind all of this] products. I absolutely adore her Stuck on Blu! base coat and of course the HK Girl Top coat. She is one of the sweetest ladies I know and I hope you'll check our her amazing products! Okay, now onto the product of the day! 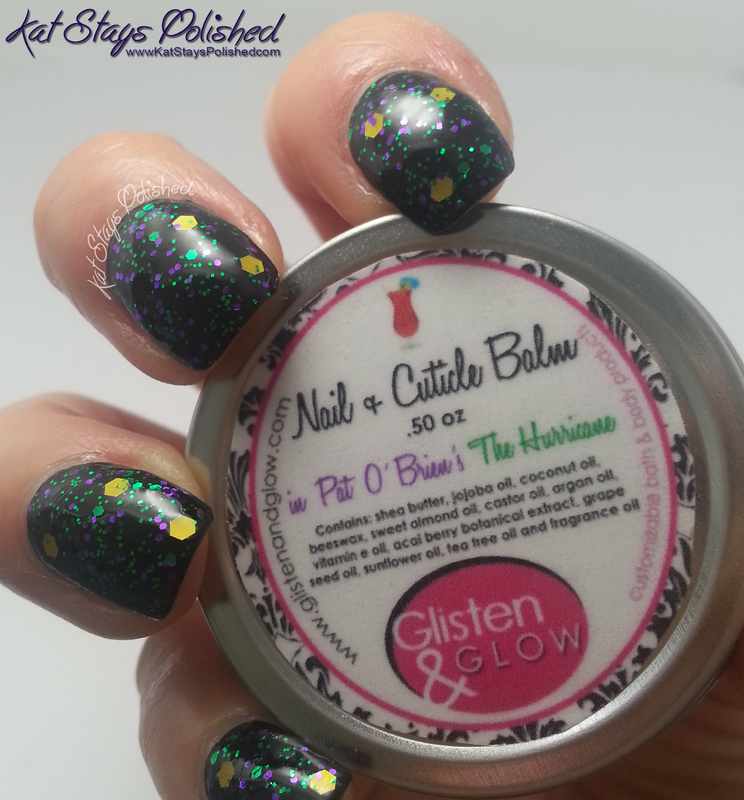 Who loves cuticle products? I DO!!! I have so many cuticle oils, balms, butters, and creams. I constantly apply products to my hands and nails, especially at work because of how often I wash my hands. Well, you can add this one to my top 3. This particular balm is a super limited-edition exclusive product to the Llarowe: A Box, Indied - March Box. If you don't know what A Box, Indied is then here's a quick rundown. A Box, Indied is a monthly subscription box sold by Llarowe that includes a variety of Indie brand nail polish and nail products. There are usually only about 150-200 boxes each month so they sell out fairly quickly. The March box will be the first one featuring a non nail polish item. 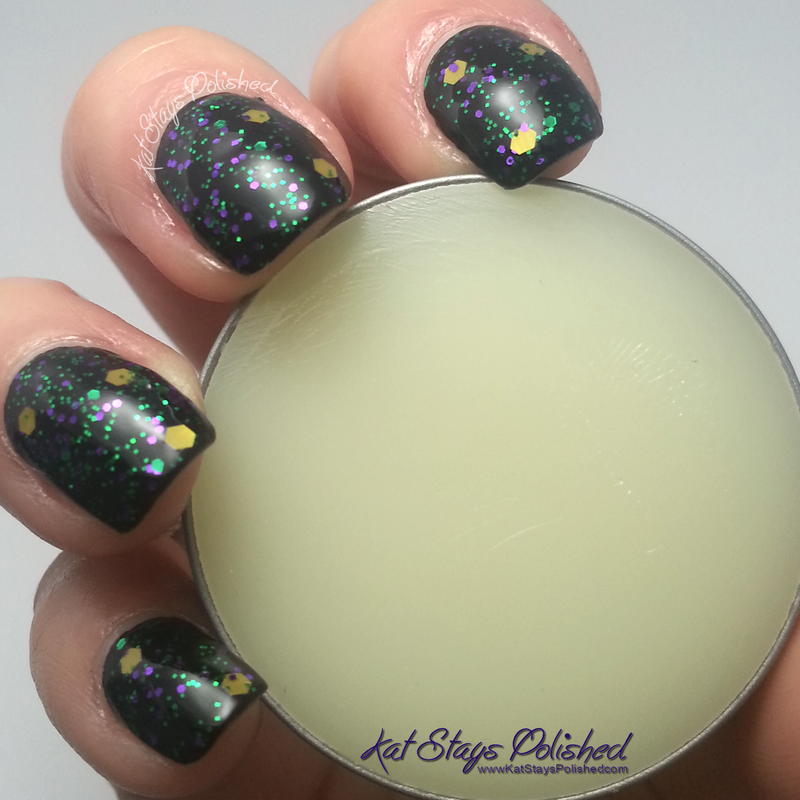 All the polishes [and this cuticle balm] will be Mardi Gras themed - sounds fun, yea? The very first thing I noticed about this cuticle balm was the packaging. I love the bright colors of the label and I love how you know exactly what it is. The name is a play on The Hurricane adult beverage from the Pat O'Brien's bar in New Orleans. The scent? A custom blend of passion fruit, orange, pineapple, grapefruit, lemon and cherry. The moment you pop the top, the fruity aroma gets you and all you want to do is have this delicious drink in hand with a pretty umbrella floating on top of it. 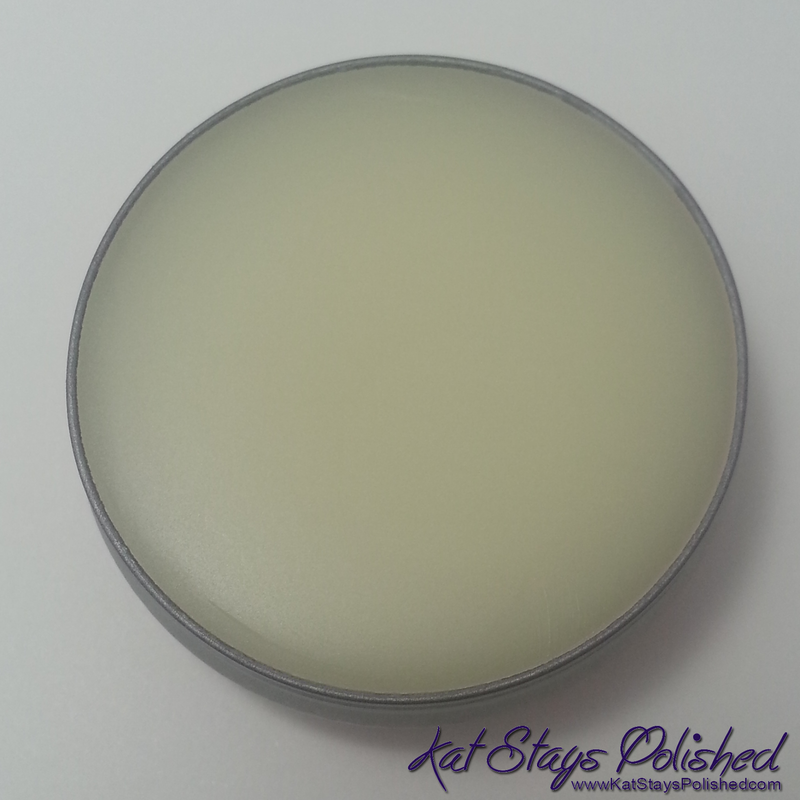 The cuticle balm comes in a .50 ounce tin and is full to the max! Now, unlike some other cuticle balms/butters/creams I have used, this one is VERY smooth, not too heavy, and absorbs quickly. It isn't greasy and you don't need a whole lot. Quick side note: I wanted to keep with the theme of the box so I found a polish in my stash by Daring Digits called Carnival. Isn't it just perfect? It's one coat over black. The picture below is right after application. Each finger has 2 light swirls of balm applied. I couldn't stop smelling my fingers! Since you don't need a lot of product to saturate each nail, this will certainly last you a long time. Even in the picture below, you can tell how smooth the product is and how little of it you need. Have I got you wanting this for yourself yet? If you want in on the March A Box, Indied, be sure to go HERE for details on when you can sign up. If you'd like to see polishes of past boxes, head on over HERE. 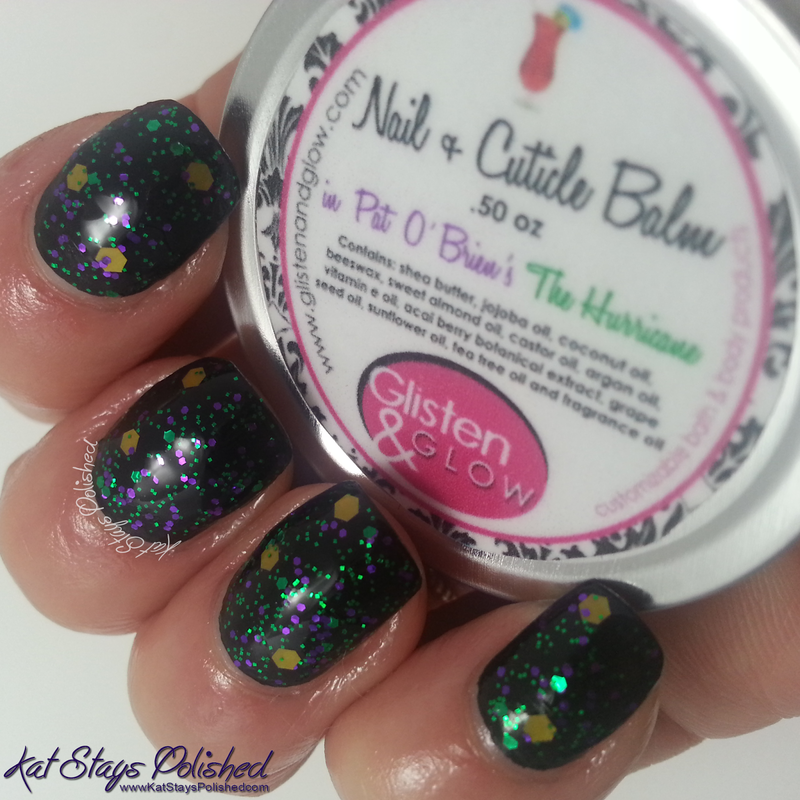 Join Glisten & Glow, Girly Bits Cosmetics, Hare Polish, Crows Toes Nail Color, and Contrary Polish for some Mardi Gras fun! This box will be available around 02/25/14 at www.Llarowe.com. Boxes are $50 a month and can be purchased individually or through an auto subscription. 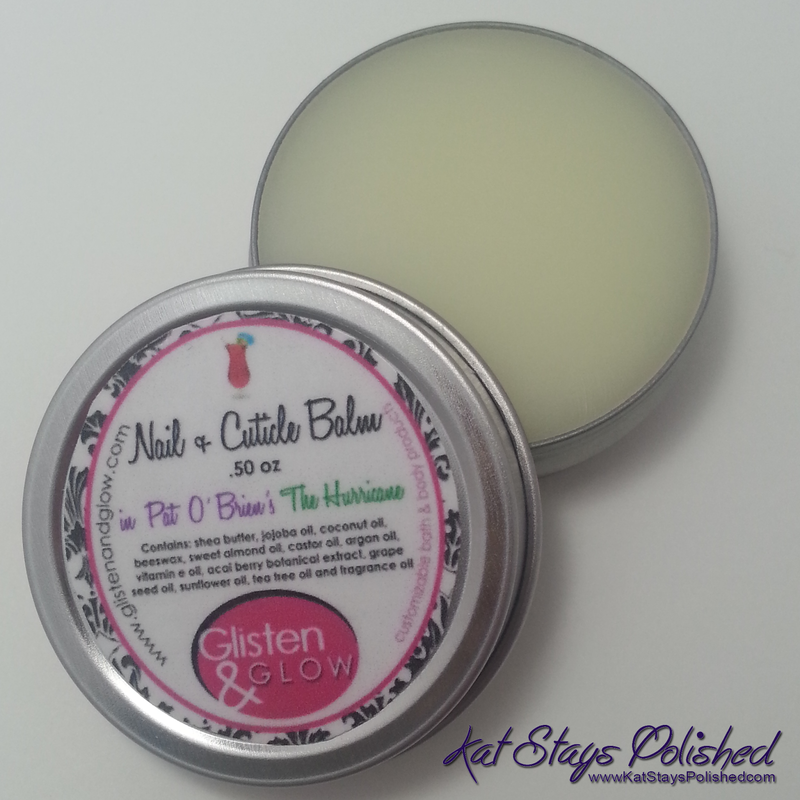 If you want more information on Glisten & Glow products, here are some links to a few products I love as well as her regular cuticle balm fragrances.